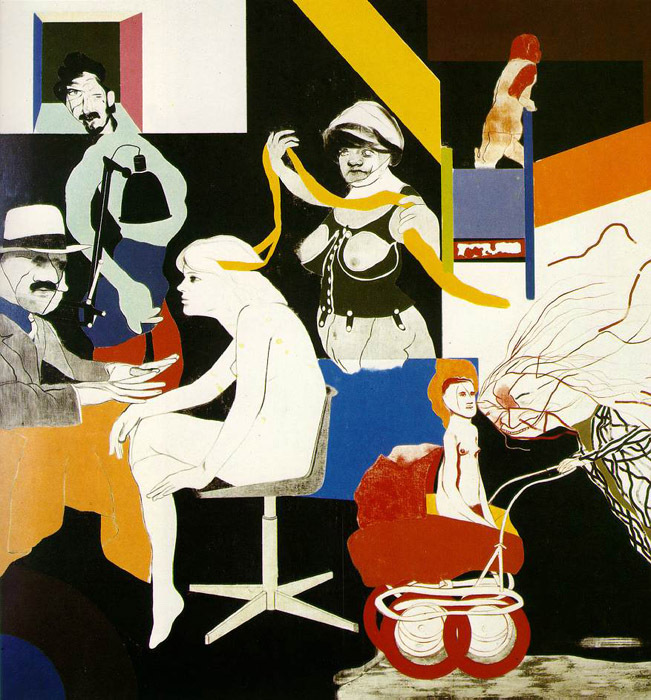 Ronald Brooks Kitaj (29 October 1932 – 21 October 2007) was an American-born artist who spent much of his life in England. Born in Chagrin Falls, Ohio, near Cleveland, United States, his Hungarian father, Sigmund Benway, left his mother, Jeanne Brooks, shortly after he was born and they were divorced in 1934. His mother was the American-born daughter of Russian-Jewish immigrants. She worked in a steel mill and as a teacher. 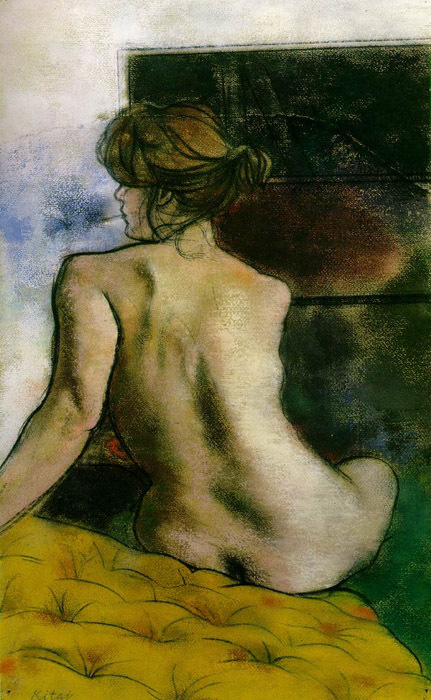 She remarried in 1941, to Dr. Walter Kitaj, an Austrian research chemist, and Ronald took his surname. His mother and stepfather were non-practising Jews. He was educated at Troy High School. He became a merchant seaman with a Norwegian freighter aged 17. He studied at the Akademie der bildenden Künste in Vienna and the Cooper Union in New York City. 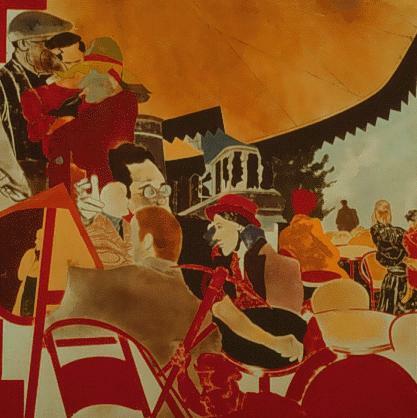 After serving in the United States Army for two years, in France and Germany, he moved to England to study at the Ruskin School of Drawing and Fine Art in Oxford (1958-59) under the G.I. 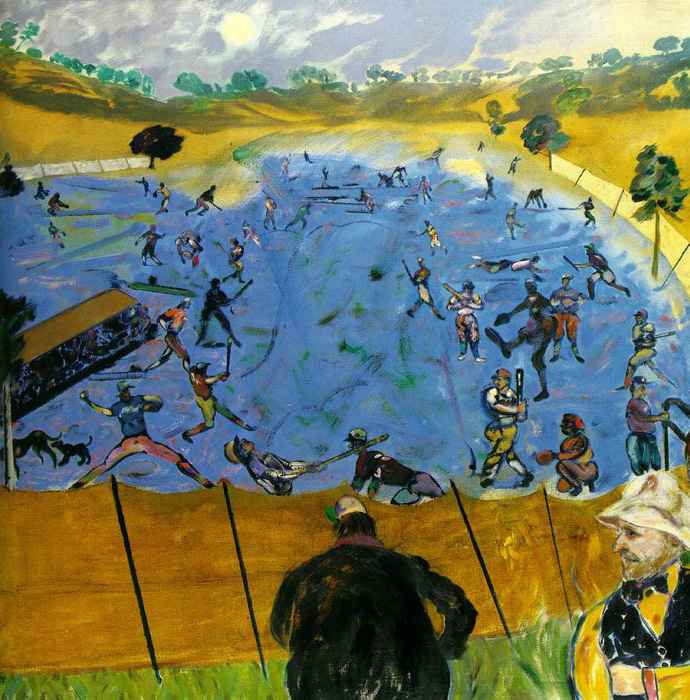 Bill, where he developed a love of Cézanne, and then at the Royal College of Art in London (1959-61), alongside David Hockney, Derek Boshier, Peter Phillips, Allen Jones, Patrick Caulfield and Richard Wollheim. 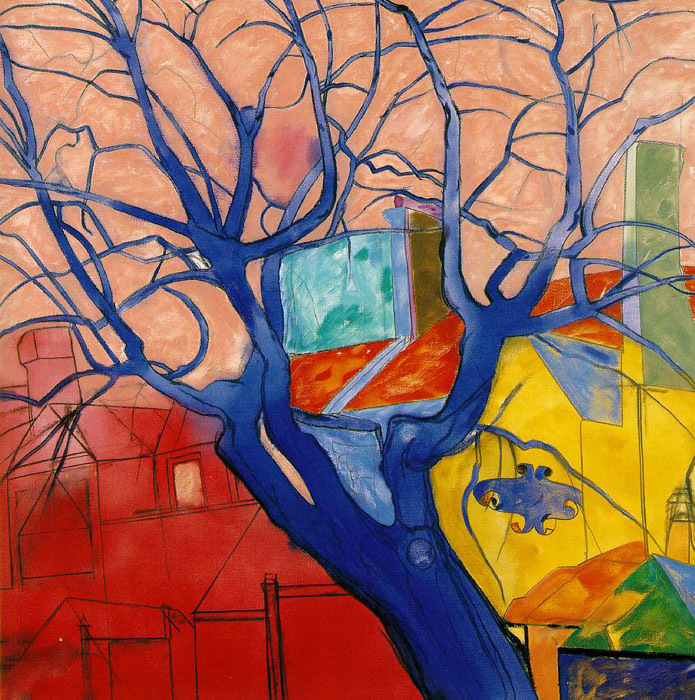 Hockney remained a life-long friend. 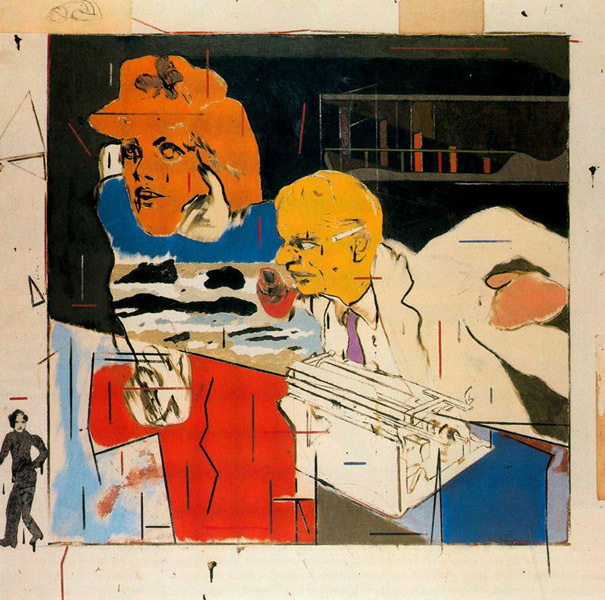 Kitaj settled in England, and through the 1960s taught at the Ealing Art College, the Camberwell School of Art and the Slade School of Art. He also taught at the University of California, Berkeley in 1968. He staged his first solo exhibition at Marlborough Fine Art in London in 1963, entitled "Pictures with commentary, Pictures without commentary", in which text included in the pictures and the accompanying catalogue referred to a range of literature and history. 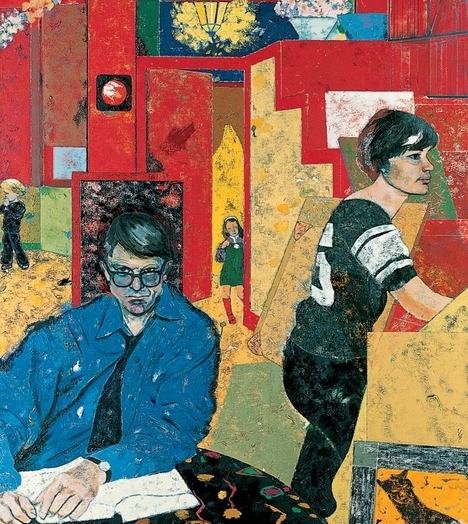 He selected an exhibition for the Arts Council at the Hayward Gallery in 1976, entitled "The Human Clay" (an allusion to a line by W. H. Auden), including works by 48 London artists, such as William Roberts, Richard Carline, Colin Self and Maggi Hambling, championing the cause of figurative art at a time when abstract was dominant. 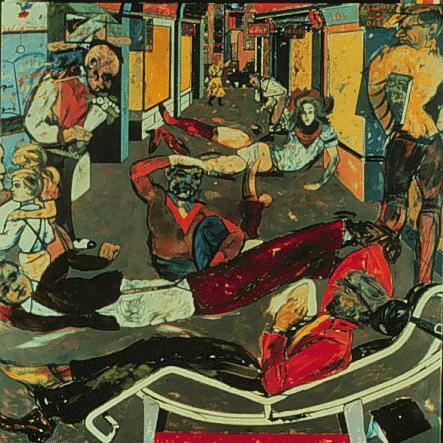 In an essay in the controversial catalogue, he invented the phrase the "School of London" to describe painters such as Frank Auerbach, Leon Kossoff, Francis Bacon, Lucian Freud, Euan Uglow, Michael Andrews, and himself.Kitaj had a significant influence on British Pop art, with his figurative paintings featuring areas of bright colour, economic use of line and overlapping planes which made them resemble collages, but eschewing most abstraction and modernism. 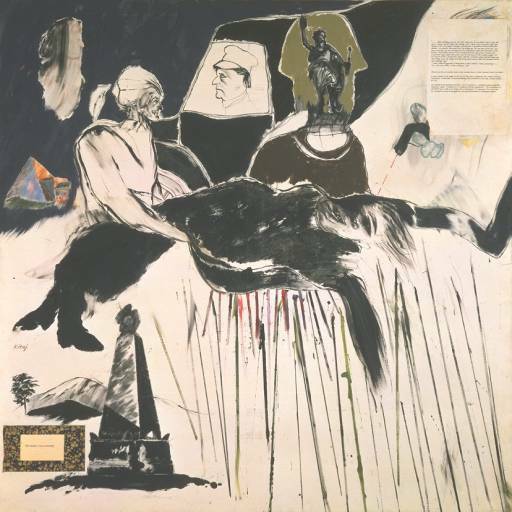 Allusions to political history, art, literature and Jewish identity often recur in his work, mixed together on one canvas to produce a collage effect. 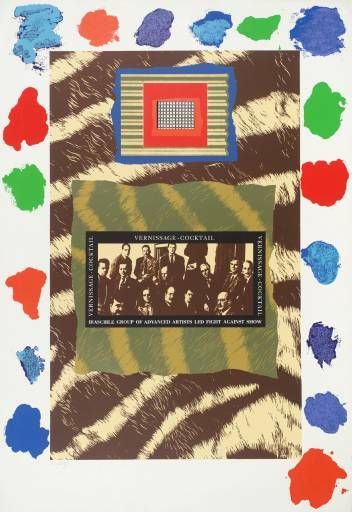 He also produced a number of screen-prints with printer Chris Prater. His later works became more personal. 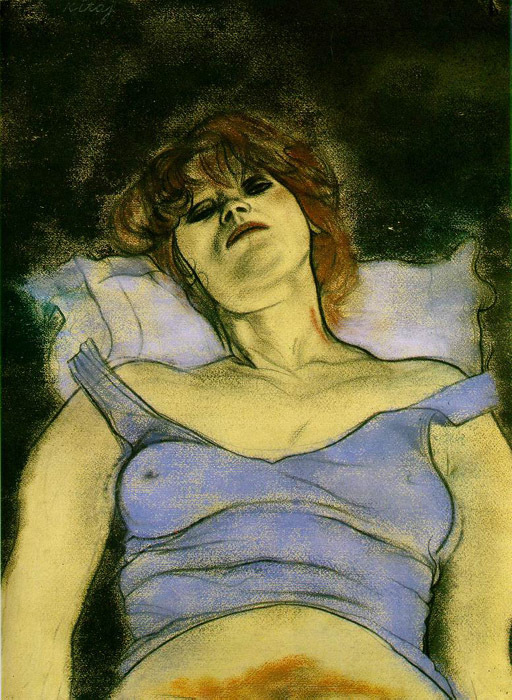 Kitaj was recognised as being one of the world's leading draftsmen, nearly as good as Degas. Indeed, he was taught drawing at Oxford by Percy Horton, himself a pupil of Walter Sickert, who was a pupil of Degas; and the teacher of Degas studied under Ingres. 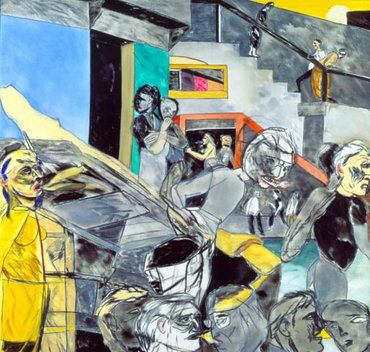 His more complex compositions build on his line work using a montage practice, which he called 'agitational usage'. 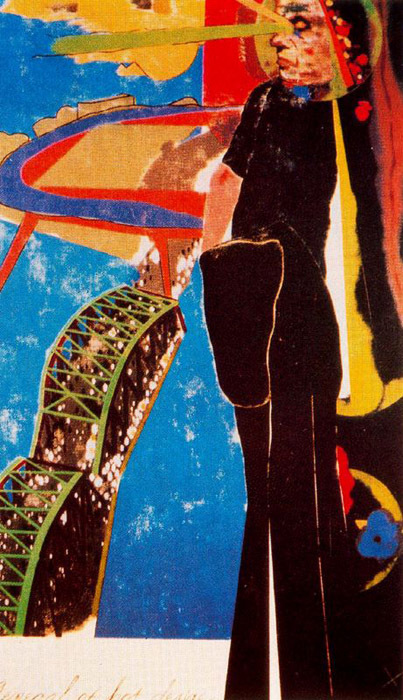 Kitaj often depicts disorienting landscapes and impossible 3D constructions, with exaggerated and pliable human forms. He often assumes a detached outsider point of view, in conflict with dominant historical narratives. This is best portrayed by his masterpiece "The Autumn of Central Paris" (1972-73), wherein philosopher Walter Benjamin is portrayed, as both the orchestrator and victim of historical madness. The futility of historical progress creates a disjointed architecture that is maddening to deconstruct.He staged a major exhibition at Los Angeles County Museum of Art in 1965, and a retrospective at the Hirshhorn Museum in Washington D.C. in 1981. 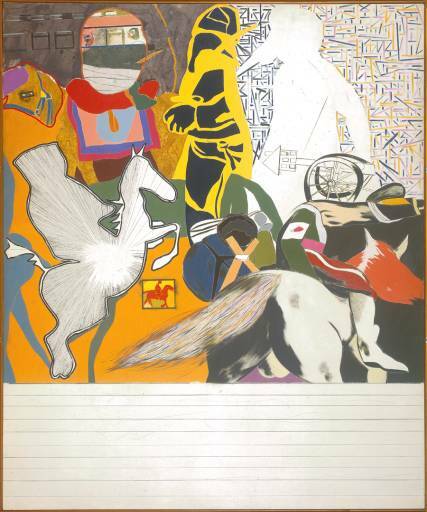 He selected paintings for an exhibition, "The Artist's Eye", at the National Gallery, London in 1980. 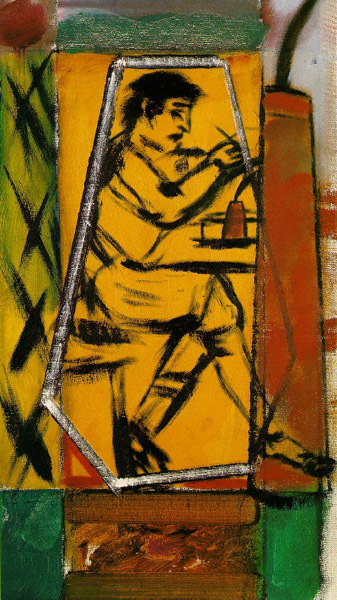 In his later years, he developed a greater awareness of his Jewish heritage, which found expression in his works, with reference to the Holocaust and influences from Jewish writers such as Kafka and Walter Benjamin, and he came to consider himself to be a "wandering Jew". 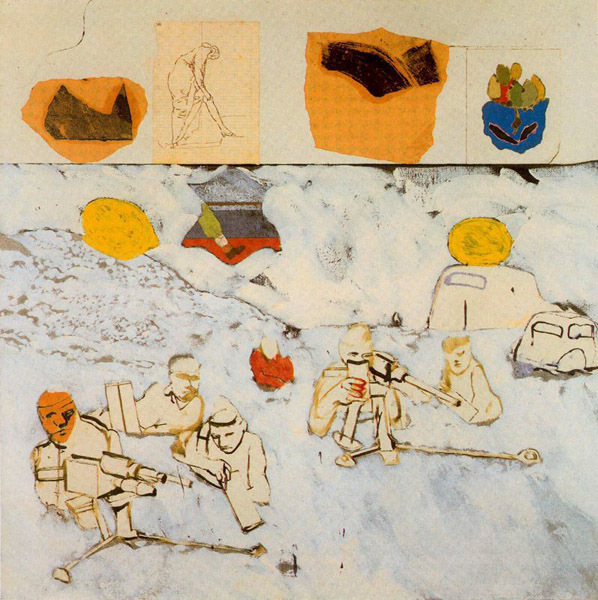 A second retrospective was staged at the Tate gallery in 1994. Despite an almost universally negative response from art critics in London, the exhibition moved to the Metropolitan Museum of Art in New York and in Los Angeles in 1995. His second wife, Sandra Fisher, died of a brain aneurysm in 1994, shortly after his exhibition at the Tate Gallery ended. He blamed the critics who savaged his exhibition for her death, and returned to the US in 1997 to live in Los Angeles, near his first son. The "Tate War" and Sandra's death became a central themes for his later works: he often depicted himself and his deceased wife as angels. 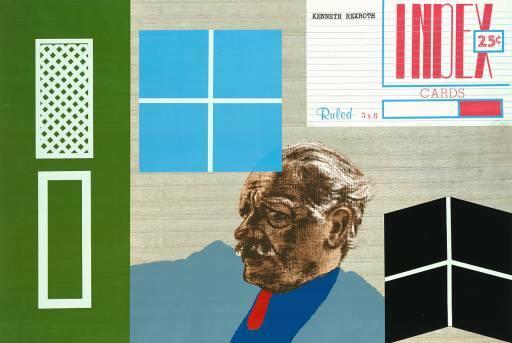 Kitaj was one of several artists to make a post-it note in celebration of 3M's 20th anniversary. When auctioned on the internet in 2000, the charcoal and pastel piece sold for $925, making it the most expensive post-it note in history, a fact recorded in the Guinness Book of World Records. He was elected to the Royal Academy in 1991, the first American to join the Academy since John Singer Sargent. He received the Golden Lion at the Venice Biennale in 1995. 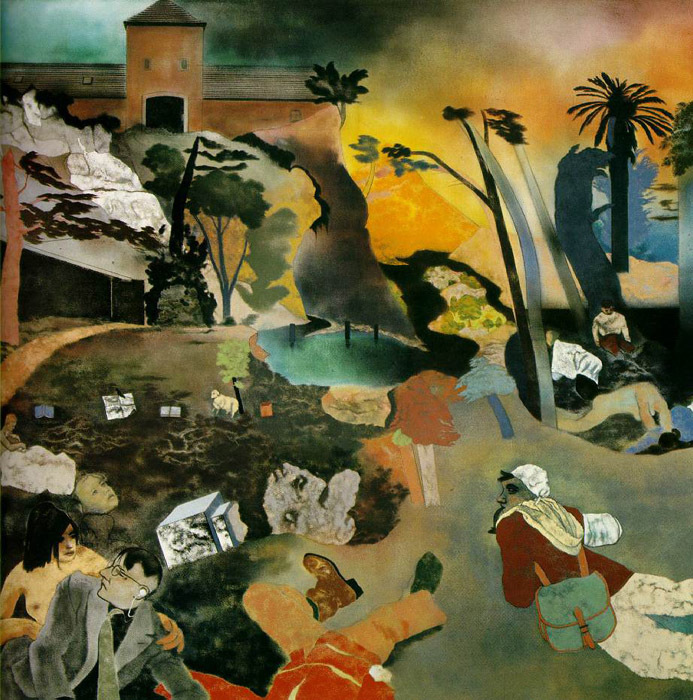 He staged another exhibition at the National Gallery in 2001, entitled "Kitaj in the Aura of Cézanne and Other Masters".